ALMS drivers at K1 Speed Addison! 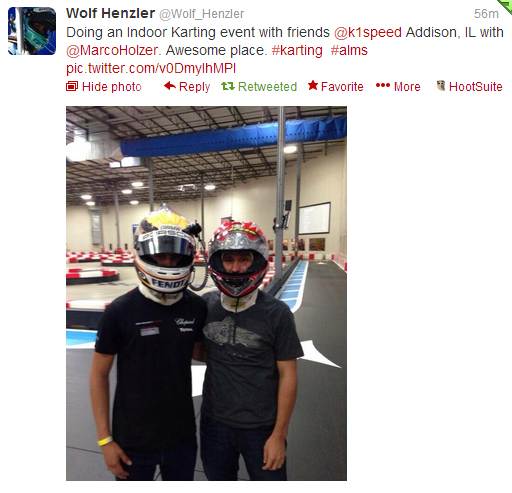 American Le Mans Series drivers Wolf Henzler and Marco Holzer at K1 Speed Addison. @Wolf_Henzler is a German racing driver known for his success with Porsches. He began racing in 1991 with a win in the German Junior Kart championship. Wolf is one of the 11 factory Porsche race drivers. @MarcoHolzer is a German racing driver. He has competed in sports car competitions such as the 24 Hours of Le Mans, 24 Hours of Daytona, American Le Mans Series and Le Mans Series as a Porsche works driver.